The Luzerne Legal Register is the Official Legal Journal and Court Reporter for the Courts of Common Pleas of Luzerne County. The Luzerne Legal Register & Reports was founded in 1872 by Attorney George Brubaker Kulp, who served as its first Editor in Chief. 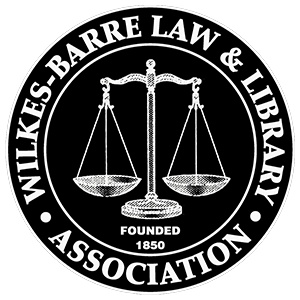 In 1905, it was acquired by the Wilkes Barre Law & Library Association, which also owns and operates the adjacent Hon. Max Rosenn Memorial Law Library. Attorney Joseph Paul Justice Burke III serves as the Register’s Editor since 1998. Attorney Burke is also the Reporter of Decisions for the Court of Common Pleas of Luzerne County. Kristin R. Breazeale is the Register’s Business Manager, Legal Notice & Commercial Ad Editor, while Gail Kopiak serves as the Register’s Bar News Editor. For Legal Notice Rates or for Rates on Commercial Legal Advertising or for what Ads are permitted by Law, Please Call (570) 822- 6712..